Freefly Alta 6, our flagship copter. This heavy-lifter drone supports the Movi M15 allowing you to fly cameras such as Alexa Mini, RED or Sony F55, providing superior image quality, elevating your production level all the way through post. The Alta comes equipped with the ability to mount the camera on either the top or bottom. This unique feature opens up a wide range of shots unavailable in a traditional bottom mounted drone and when paired with our Movi remote we have the capability to control iris, zoom and focus making the possibilities from the sky endless. The Inspire 2 Zenmuse X7 and X5S are our most requested drones in our fleet. This drone takes everything that was good about the Inspire 1 and improved it substantially. Capable of recording up to 5.2K in CinemaDNG RAW, Apple ProRes, and it's ability to accelerate from 0 to 50mph in just five seconds, no doubt why everyone loves this drone. Inspire 1 Pro Zenmuse X5/R - If you want portable, quick, affordable, high image quality then the Inspire One Pro with Zemuse X5/R is your drone. Probably the most requested drone in our fleet for reality television as it allows you to shoot on the move without losing tons of time. We have hiked this drone up the side of mountains and taken it out to sea on ships, it never disappoints. The Zemuse X5 R is an ultra stable micro 4/3rd size sensor camera with an array of lens choices from Olympus including 12mm, 15mm, 24mm, and 45mm. We can glide this bird solo or with a team of two in dual operator mode for more stunning cinematic shots bringing the production value of your show into the sky. Designed and engineered for broadcast, live events, and feature films needing higher capacity payloads, redundant safety features, and the power to perform in harsh environments. This cable cam supports our Freely Mōvi M15 allowing you to glide cameras such as the Alexa Mini, RED or Sony F55, and gives you the capability of getting the shots that a drone would not be typically able of flying through safely. With the adjustable speeds at 30+ mph, quick turn-around for getting multiple shots, and ability to pair with our Mōvi remote, it’s no wonder why this piece of equipment is getting so much attention. The smallest and the quickest setup for a cable cam ever! This thing can be up in minutes to get you the shots you’ve never been able to achieve before! Whether you want it inside a restaurant, strung through the woods, or at a sporting event, we can have it up in no time! Rigged with one of our Osmo’s with the Zenmuse X5 or X5R, you’ll love the quality you can get with this new piece of technology! This is the Rolls Royce of handheld camera stabilizers and the go to unit for us for handheld, in the air, and on the Tero. You will be so surprised when you pick this stabilizer up at how light it is. With the ability to carry a payload of up to 15 pounds this bad boy can handle almost anything you throw at it including: RED, Alexa Mini, Sony F55, C300 and many many more. When paired with our MOVi controller we have the ability to operate dual mode while controlling Focus, Iris, and Zoom. Also integrating a full cage system your camera will never be more stabilized while running, flying, or cruising. 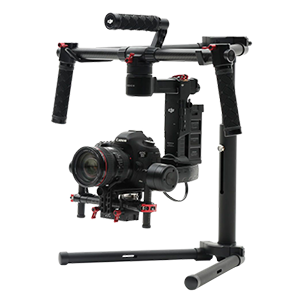 We pair our MOVi with the Connex wireless video system which allows latency free 1080 transmission at over 1500′. If you need a great camera stabilizer at a low end budget or if you are in a rough and tumble environment then the Ronin is your choice. You won’t be scared to take a few risks with this unit as it is very strong. The Ronin is very quick to set up and can also be paired with our remote Focus, Iris, and Zoom system. The Ronin can carry anything from a 5D, C300 and Red Cameras. Either of our stabilizers can be paired with the easy rig system to lighten the load even more. Freefly Tero creates the gliding sensation of a drone but from the ground. Equipped to carry the Movi M15 it can reach speeds of up to 40mph making it perfect for low, slow-moving or fast-moving shots, and dollying shots. The Movi Controller features a precision Pan/Tilt joystick as well as high resolution Focus, Iris and Zoom controls. This wireless remote system allows you the ability to readjust your Movi on the fly. This is the ultimate remote for dual operator mode as well as drone operations.